In some cases being a ‘soft touch’ is a positive and appropriate. But not when one is the Prime Minister. Jacinda Ardern is increasingly looking out of her depth. But if she’s not really in control of the country, the question is, who is? A coalition between New Zealand First and the Greens was never going to be easy. Popularism does not sit comfortably with environmental and social justice extremism. Controlling those conflicting agendas was always going to be a challenge for the new Prime Minister. But questions are now being raised about whether she’s up to the task – which is probably what Winston Peters knew when he selected her, rather than Bill English, for the top job. The reality is that barely five months after the election, the ‘Jacindamania’ star dust has disappeared and the Prime Minister’s role is already appearing more symbolic than real, with David Parker, Grant Robertson, and Winston Peters seemingly running the show. The PM must be counting down the days to 14 June when she takes maternity leave. Jacinda Ardern’s soft touch was all too evident in her response to the reports of under-age drinking and allegations of sexual assault at a Young Labour-organised summer camp. The problem for the PM was that the Party’s hierarchy failed to notify her, the Police or parents about the affair. Yet, in spite of being badly let down, no heads rolled – no-one was held to account for the raft of serious failures. Her soft touch on Russia made New Zealand into a laughing stock on the world stage. In response to the call by the British Prime Minister Theresa May for solidarity, following last month’s chemical attack in Salisbury, almost 30 countries have expelled around 150 suspected Russian spies. Her comments, which would have brought the house down if it were a comedy festival, resulted in mockery around the world. The Guardian newspaper’s headlines were typical: “New Zealand says it would expel Russian spies … but it can’t find any”. 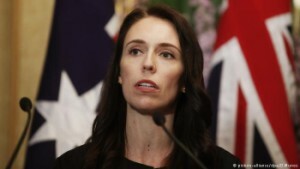 The Prime Minister’s claim that New Zealand is spy-free is even more bizarre given New Zealand is a member of the Five Eyes intelligence alliance alongside Australia, the UK, the US and Canada. Meanwhile in Britain, the retired Russian spy Sergei Skripal – a double agent who had worked for British intelligence – remains critically ill in hospital after being poisoned last month by a rare, military-grade and deadly nerve agent that reportedly could only have been produced by Russia. His daughter Yulia, who was also poisoned, is now reported to be improving. This latest attack on British soil follows the 2006 attack on another former Russian spy, Alexander Litvinenko, who died after being poisoned in a London hotel by a rare, highly radioactive isotope. That murder, a British inquiry found, was most likely to have been ordered by the Russian President. In fact, a number of Russians, who may have fallen foul of the Kremlin, are reported to have died under suspicious circumstances in Britain – such as from heart attacks while jogging and mysterious ‘suicides’ – including one such case, where the ‘suicide’ victim was impaled on an iron fence after falling from a building. Those deaths are now being re-examined. The countries that have expelled Russian diplomats to date include the United States, which has expelled 60, Britain 23, Ukraine 13, Nato 7, Canada 4, France 4, Germany 4, Poland 4, Czech Republic 3, Lithuania 3, Moldova 3, Albania 2, Australia 2, Denmark 2, Italy 2, The Netherlands 2, Spain 2, Belgium 1, Croatia 1, Estonia 1, Hungary 1, Ireland 1, Finland 1, Latvia 1, Macedonia 1, Norway 1, Romania 1, and Sweden 1. By going soft on Russia and taking far too long to support Britain, Jacinda Ardern made it look like Winston Peters was driving the response, instead of her. In fact, Jacinda Adern seems increasingly uncertain about how to handle New Zealand First. When the Minister for Regional Development, Shane Jones, made his over-dramatic call for heads to roll on the board of Air New Zealand, the PM’s call for him to desist was ignored. Yet even though the Minister would have known that board members are elected at the company’s annual general meeting in accordance with Stock Exchange rules, that didn’t stop his attention-seeking. By ignoring Jacinda Ardern, Shane Jones made her look like a PM without influence. Then there was the bizarre Jenny Marcroft affair. It is simply not credible that a new backbench New Zealand First list MP would, off her own bat, attempt to gag an experienced National MP, to prevent him from asking New Zealand First Ministers awkward questions in Parliament. In fact, it’s about as credible as suggesting the Aussie cricket captain didn’t know his newcomer bowler was applying sandpaper to the cricket ball. The controversy centres on the fact that the Mahurangi River Restoration Project, which the Rodney electorate MP Mark Mitchell has long championed, is under the jurisdiction of the Auckland Council and therefore doesn’t strictly meet Provincial Growth Fund criteria. If New Zealand First’s Regional Development Minister was to fund the project, he would be breaking the rules. Mark Mitchell alleges that New Zealand First had threatened to withhold regional development funding for the project, unless he ended his involvement and stopped criticising their ministers. He claims Jenny Marcroft said she was acting under instruction from a Minister, but refused to name who it was. She later sent a text message asking him “to forget the conversation”. At least the Aussie cricketers admitted cheating. Then there was the bizarre behaviour of the Greens. There is a view that the move is less about improving accountability, and more to do with preventing the non-ministerial Green MPs from raising concerns of party members that may prove embarrassing to the Government. However, whatever the reasoning, the move by James Shaw was extraordinary and done without regard to the Prime Minister or their agreement. But without a doubt, the Prime Minister’s biggest debacle has been the Clare Curran affair. In their election manifesto, Labour’s promise of a $38 million boost for “quality programming and journalism”, included plans to turn Radio NZ into a fully multi-platform non-commercial broadcaster, with a free to air television service. As Broadcasting Spokesman, Clare Curran strongly supported a new TV station, and after becoming Minister, arranged a meeting with Radio NZ’s Head of News, Carol Hirschfeld, whom she knew to be supportive. With the Radio NZ Board having different objectives, the meeting was not arranged through the proper channels used for Ministerial meetings. In the end, the attempts by Carol Hirschfeld to cover up the fact that the meeting had been pre-organised and wasn’t just a chance encounter, cost her her job, since it resulted in the Radio NZ Chairman, Richard Griffin, and Chief Executive, Paul Thompson, misleading a Parliamentary Select Committee. The instigator of the whole saga, Clare Curran, however, got off scot free, with the Prime Minister claiming, “The Minister, in holding this meeting, was not acting in breach of the Cabinet Manual”. Since Clare Curran was aware that the Radio NZ Chief Executive – who had already set up a television service to broadcast Checkpoint at 5pm each day – was opposed to a new stand-alone full-time TV station, she knowingly breached the Cabinet manual rules when she arranged the ‘off the record’ meeting with a Radio NZ employee. As a result of that statement, Jacinda Ardern is now misleading Parliament. Media independence is of crucial importance to the proper functioning of a free democracy. Any hint of secret deals involving Government Ministers is improper. It appears that Clare Curran is in breach of that protocol as well. While Jacinda Ardern would not want to sack a minister just five months into her new Government, going soft on Clare Curran has made her look weak – yet again. It seems the Prime Minister is also struggling with policy decisions. With increasing regularity, issues that she once stood firm on, are being deferred to ad hoc review panels. Clearly she wants them to make controversial decision, so she does not need to. But running away from accountability is no way to run a country – it inevitably creates a vacuum that others will fill. In some areas, where the Government has appeared decisive, their decisions are now being questioned. This is the case with their hastily drafted Overseas Investment Amendment Bill, which submitters are overwhelmingly saying will be an absolute disaster for the country. In other cases, the Prime Minister has been decisive in front of supporters, only to later change her mind. This was the situation over oil and gas exploration – she told a Greenpeace rally on the steps of Parliament that her Government was “actively considering” a call to end oil and gas exploration, only to later explain to Parliament that exploration is set to continue until at least 2046. Reality is setting in for the new coalition government. It’s a tenuous alliance at best. To survive, it requires strong leadership and the certainty of knowing who is really running the country – but is it the PM? Who do you believe wields the most influence in the new coalition: Jacinda Ardern, Grant Robertson, David Parker, Winston Peters, or Shane Jones?